Casa Don Carlos, your vacation dream house! This Spanish Colonial house was fully restored in 2007. It is located in a wonderful neighborhood of Granada City, Nicaragua. The exquisite details of this three-bedroom home include beautifully intricate colonial tiled floors, Spanish architecture, an interior courtyard with a peaceful garden ornamented with a Spanish fountain and a volcanic rocks cascade to create a perfect peaceful sound. The hand carved Nicaraguan furnishing, integrated arches between the living-room area and the corridors give the house a very open and airy ambience and allows the eye to enjoy all the exquisite details that surround the interior of the house. The layout is open-air style. The kitchen is set between the corridors surrounding the courtyard and the living-room area. The two bedrooms are tucked away on the first floor sharing one full bathroom. Both rooms are equipped with full size beds and air conditioning. The Master Suite has a queen size bed, a private elegant full bathroom, spacious closets, air conditioning, and is located on the second floor. It has access to a porch surrounded by beautiful verandahs to enjoy sitting down having your breakfast, relaxing, preparing for the day, drinking the excellent Nicaraguan coffee, listening to the birds and the sound of the beautiful morning filtering down into the courtyard. 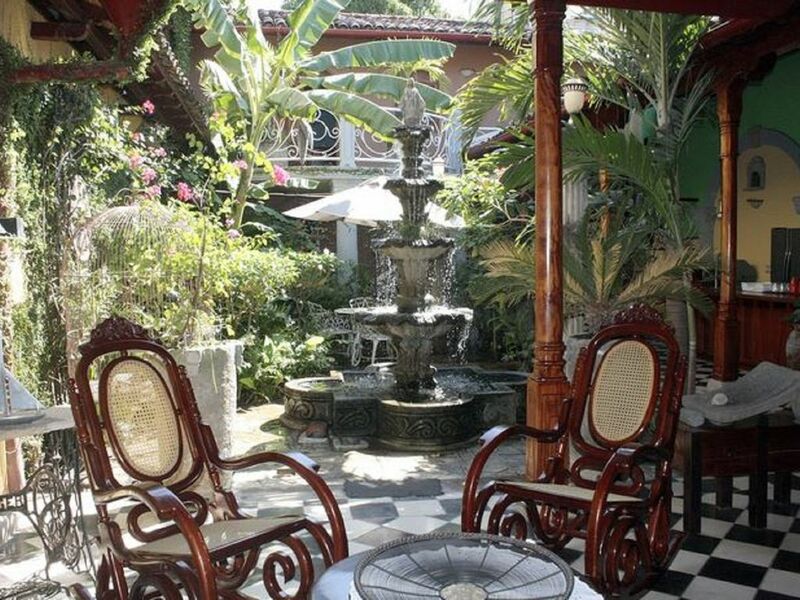 One of the most enchanting features of Casa Don Carlos is on the 3rd floor. The “ Mirador” offers a beautiful view of the Mombacho Volcano with all the wild hills which allows you to see although from afar, the northwest of the oldest Colonial city of the American continent.. Please note ELECTRICITY charges are separate! My name is Oscar R. Goussen native of Granada Nicaragua, I was born 1 block away from Casa Don Carlos and the name of my house was given in memory of my father. I live in Redwood City California with my wife Anca and our son Ancarlos. I bought this house and restored it as a Vacational House. Calle Palmira is the gate to Mombacho Volcano and to the Isletas de Assese, close to the Farmer's market, Supermarkets and Downtown. It's probably one of the best locations in Granada as it is not quite in the heart of the City yet it's so close to all best places. The main benefit when I spend my vacations here is the peacefulness and relaxed atmosphere that soothe my mind, body and soul as a perfect therapy session. My eyes enjoy the view of the house with its elegant details and the amazing scenery. My vacations never seem long enough and I always dream of coming back. Smoking allowed only in the patio area, never in bedrooms. Directions: Coming from the Villages – South: Entering the City of Granada you will pass by a cemetery. Turn right onto Calle Nueva (~6 blocks).Take another right onto Calle Palmira (very busy street, drive with caution) Once you go over a small and narrow brick bridge keep straight for 1 long block. Casa Don Carlos is on the left with 2 palm trees in front of the house. From Managua - North: Entering the City of Granada you will pass by a Stadium - left hand side. Keep straight for (~7 blocks). Turn right on Calle Atravezada reference point is the Park - left hand side. Keep driving on Atravezada for 1.5 mi. After the Public Market, Atravezada becomes Calle Palmira. Once you go over a small and narrow brick bridge keep straight for 1 long block. From Costa Rica: Take Pan-American Rd that passes through Rivas and Nandaime (~47mi). After City of Nandaime (~1 mi) bare right at fork (Y Intersection) toward City of Granada (~25mi). Follow same directions as coming from the villages. What a cool experience! We got to pretend we live in the city of Granada, lodging in our safe haven full of style and history. I have always loved the idea of having a courtyard within my house. The garden area not only provided beauty, when we sat around reading our books, but also amusement as we observed the turtles, who abide in the hidden foundation. We only spent four days there but we already have accumulated much fondness for Anselmo, the caretaker of the house. He is such a lovely man and we are grateful for that he time he spent with us; explaining how things work, answering our questions, sharing of himself and his story. We didn’t arrive until 9:30pm and when we asked about a grocery store, Anselmo offered to drive us there that night so we could have stuff in for breakfast. 1. Power consumption: Old air conditioners and old-style lightbulbs throughout the house contribute to high power usage - they should be replaced for efficient models and LED lights. 2. Bed cover is synthetic and not very pleasant to sleep under (for me). Beyond that, a great house. Anselmo the property manager is super-nice and accommodating. Would stay here again. We appreciate your honest review and agree to all of the items mentioned. This summer we are planning a major upgrade which has been long overdue; the items on your list are also on our list. We have been pushing this remodel for some time now because we would like to be there when things are getting done to ensure that all goes as we want to. It's hard to work on things while being so far away, leaves little to no control. We hope that if you visit us in the future (after the remodel/upgrade) you will have a better experience. The home is beautiful and the caretaker- Anselmo is a lovely man with stories and a beautiful smile. The walk to town was a bit far for us with young kids- so we took taxis a lot. Also one room downstairs had no mosquito net and we got bitten alive. We asked for one but got a can of insecticide instead- not ideal with young kids around. Hopefully they will fix that. Otherwise a lovely colonial home. Enjoyed everything at the home. Service was excellent from the local hosts. but don't tell the owners. Thank you bunches for this review, we just now took note of it. We're most contempt to to hear that you've enjoyed your stay at our house and we welcome you in the future should you visit my home land again. Our family had a fantastic time in Granada over Christmas thanks to this lovely house. The location is fantastic, the house is charming, the garden is beautiful and the price was right. It is a 10 min walk through the bustling market to the main square. The owner was very responsive and helpful and we would definitely recommend this place to anybody. Fantastic house! We had a wonderful, relaxing stay with our three year old son. The home is beautiful, with two fountains, a lush garden, and lovely, comfortable furniture. My son enjoyed visiting with the two parrots (feed them your fruit scraps!) and three turtles. It is located about a fifteen minute walk from Granada's central square (or a 50 cent shared cab ride) and a ten minute walk from the central market and a major supermarket. The home is so beautiful and relaxing, and we so enjoyed spending time there, we didn't do nearly as much exploring of Granada as we had planned. We look forward to returning again soon. Our house is located just a couple of blocks from the Farmer's Market (2005 Calle Palmira, Iglesia San Jose de la Montana, 1 block South) which is such a big attraction for everyone visiting Granada. It's so much fun to walk to the market and meet the locals. While not precisely in the heart of Granada City it offers that extra privacy and quiet, one needs after a long day full of fun activities. It's still within walking distance of all the lovely places to hang out such as: Parque Central, Pre Colombian Museum, The Cathedral and La Calzada. I guess you just have to come see for yourself! House cleaning 5 days per week Mo-Tue-Thur-Fri-Sat except Holidays. 1 indoor parking. ELECTRICITY NOT INCLUDED!!! Optional services extra cost: Airport Shuttle, Cooking, Tours/Trips. Directions: Coming from the Villages – South: Entering the City of Granada you will pass by a cemetery. Turn right onto Calle Nueva (approx. 6 blocks) Take another right onto Calle Palmira (very busy street, so drive with caution) Once you go over a small and narrow brick bridge keep straight for 1 long block. Casa Don Carlos is on the left with 2 palm trees in front of the house. From Managua - North: Entering the City of Granada you will pass by a Stadium (on the left hand side). Keep straight for approx. 7 blocks Turn right on Calle Atravezada reference point is the Park (on the left hand side). Keep driving on Atravezada for 1.5 mi After the Public Market (El Mercado) Calle Atravezada becomes Calle Palmira. Once you go over a small and narrow brick bridge keep straight for 1 long block. From Costa Rica: Take Pan-American Rd that passes through Rivas and Nandaime (approx. 47mi) After City of Nandaime (abt. 1 mi) bare right at fork (Y Intersection) toward City of Granada (approx. 25mi). Entering the City of Granada you will pass by a cemetery. Turn right onto Calle Nueva (approx. 6 blocks) Take another right onto Calle Palmira (very busy street, so drive with caution) Once you go over a small and narrow brick bridge keep straight for 1 long block.